You’re walking past the dog park, Fido has just dropped his ball at his owner’s feet again. He is panting; typical? Of course! He’s trying to cool down. Panting is how a dog cools themself down after chasing their ball in the park. But what exactly is panting and is there a time you should be worried? 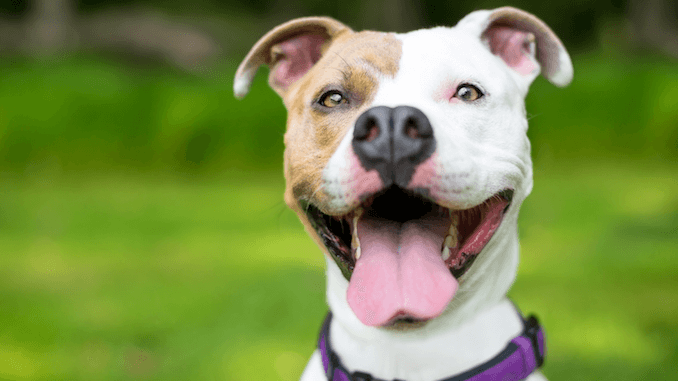 In this article we take you through the science behind panting, why your dog will pant and some of the physical changes you should expect to see during and after your dog pants. Panting is characterised by fast, shallow breaths, a wide open mouth and an extended tongue. Panting is generally associated with a dog trying to cool down, also known as thermoregulation. Cooling results from the inhalation of cooler air and exhalation of heat and the evaporation of water in the dog’s respiratory system. What is the purpose behind panting? 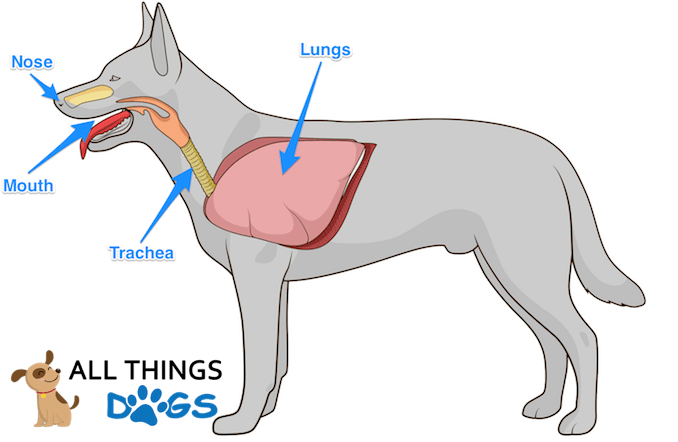 The respiratory system in dogs is made up of their mouth, nose, trachea and lungs and it serves two main functions. Firstly, like in humans, it is how a dog’s body exchanges carbon dioxide and oxygen. In general, healthy dogs will have a resting respiration rate of anywhere between 15 and 40 inhalations and exhalations a minute. The typical respiration rate when panting increases 10 fold, so up to 400 inhalations and exhalations per minute is expected. It’s second function is to regulate body temperature. A normal body temperature for a dog is between 38.3°C and 39.2°C. An increase by just 1-2°C can have major effects on the dog’s system. They therefore rely on panting as their primary means of expelling heat. Inhalation through the nose and mouth and exhalation through the nose and mouth. It is suggested that the most effective cooling system is when air is directed through the nose and out through the mouth. So why don’t dogs sweat to cool down? The human mechanism for cooling down is to sweat. As sweat evaporates, we cool down. Due to the thick coats dogs have, sweat just wouldn’t evaporate resulting in a thick, furry coat full of sweat! Nice! Dogs do have sweat glands, but only on their paws. It is rare to see a dog with sweaty paws after exercise. You will tend to find sweaty paws during a visit to the veterinarian as a response to being stressed. 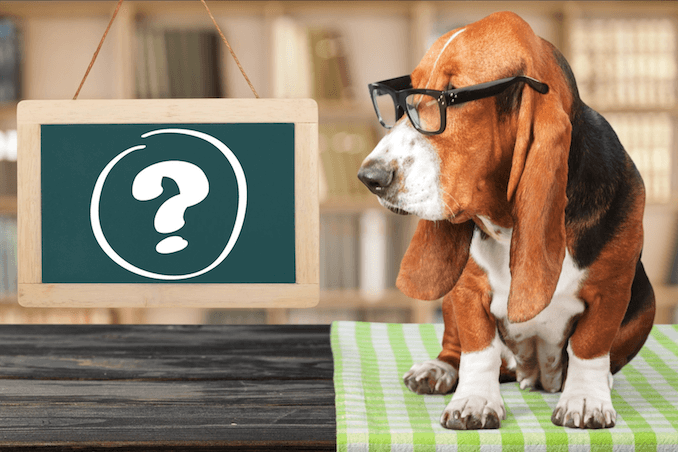 What are the triggers and causes for a dog panting? There can be multiple triggers behind a dog panting; some physical and some psychological. This is a well known cause for panting in dogs. Exertion increases heart rate and overall body temperature. Therefore, to regulate their body temperature, dogs will pant. It would be typical to see dogs panting after running around the dog park or during and after their daily walk(s). 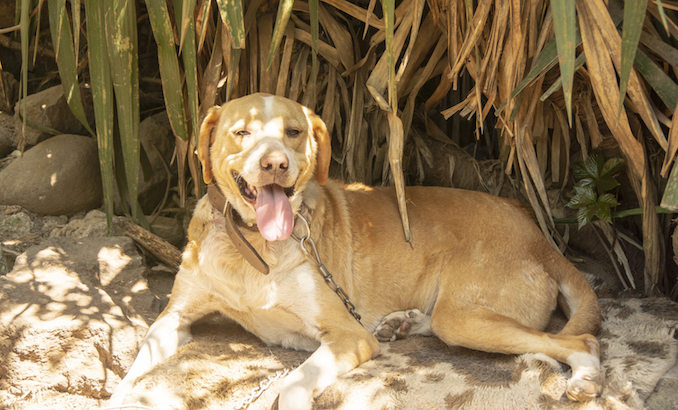 It is suggested that it can take from 7-60 days for a dog to acclimatise to a temperature change in the environment. This can be influenced by body shape, size, coat type and length and the overall health of the dog. The Pugs dog breed is more sensitive to environmental changes. These are known as brachycephalic breeds and due to their small nasal passages and short windpipes, they don’t pant as efficiently as other breed; This puts them at a much higher risk of heatstroke. With any dog, expect to see more panting in the warmer months, but also expect to see it when your pooch is baking himself in front of the log fire in the middle of a snow storm! Many dogs who suffer with anxiety or fear will pant. It is thought that the fear response increases the heart rate which in turn raises the body temperature. There are usually other signs that accompany panting in a fear response, such as yawning, pacing, crying, whining, shaking, lip licking or hiding. Electrical storms, and major holidays with fireworks, are often a source of anxiety for dogs, so it is quite common to see more panting during these times. Thunder Jackets A vest for your dog designed to provide consistent pressure to your dog’s body which produces a calming effect. Panting accompanied with shaking is a typical stress response in dogs so consider whether there has been any change to their daily routine, even the smallest changes can be worrying for some dogs. Is panting a symptom of a long term health condition? There are a number of long term health conditions in which panting is one of the symptoms. Some of these health conditions are more serious than others (e.g. Heart failure and Heatstroke), however, all should be understood and investigated. When the heart is no longer pumping oxygenated blood efficiently, body parts and tissues will become oxygen deprived in your dog. The easiest way to correct this depletion is to increase respiration which often results in panting. Older dogs are more susceptible to heart issues. The ageing process in canines naturally causes your dog’s organs and systems to deteriorate. Heart failure can also occur as a result of heartworm disease which is a risk in all 50 US States. Heartworms are spread through mosquitoes. Infective heartworm larvae migrate through the dog’s body until they reach the heart and blood vessels in the lungs. Heartworm prevention medications are available and should be administered to all at risk dogs. 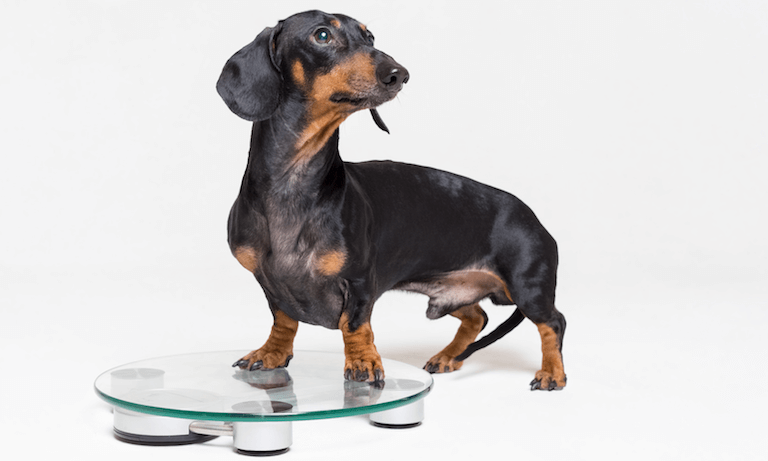 In determining whether your dog is a healthy weight, you should be able to see a waistline, feel the ribs and from a birds eye view, your dog should have an hourglass outline. Overweight dogs will often pant excessively; this is due to the strain placed upon the cardiovascular system. 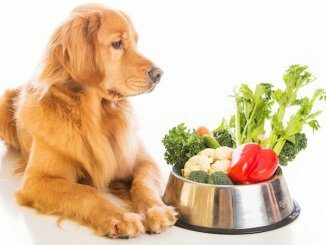 Maintaining a healthy weight in your dog should be achieved through species appropriate diet with portion control and regular exercise. Gaining weight can be a symptom of other health issues so be sure to seek veterinarian advice if you are concerned. This is a when the adrenal glands produce too much cortisol, also known as hyperadrenocorticism. Cortisol is produced and stored by the adrenal glands in dogs; two small glands which sit on top of the kidneys. Investigation of the cause will usually be tumours found on the pituitary or adrenal gland. Veterinarians will use blood tests to diagnose Cushing’s disease. a bloated or pot bellied appearance. Although there is no cure for Cushing’s Disease, it can usually be well managed with medication. At the other end of the scale is Addison’s Disease, also know as hypoadrenocorticism. This is where the adrenal glands don’t produce enough cortisol and aldosterone. The outer layer of the adrenal gland contributes to the maintenance of sodium, potassium and water levels within your dog’s body. Again, veterinarians will use blood tests to diagnose. As with Cushing’s disease, tumours are prevalent. As you can see there are a number of long term health conditions that can cause panting. This can include: Heart Failure, Obesity, Cushing’s Disease and Addison’s Disease. Owners should also be mindful of more immediate health issues which can cause panting in dogs. 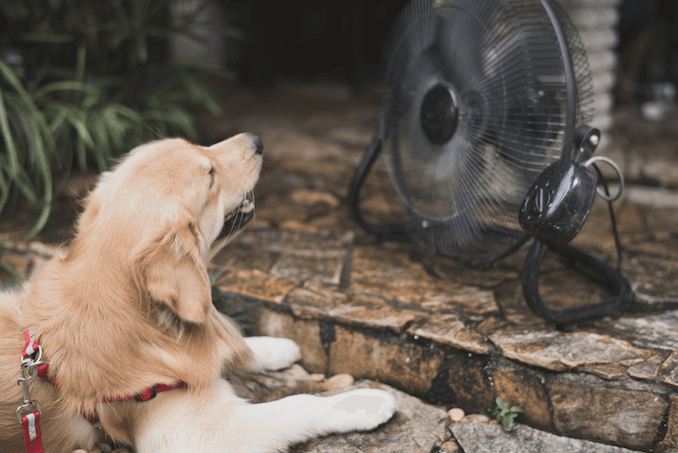 In addition to long term health conditions, excessive panting may be an early indicator your dog is suffering from an acute illness such as heat stroke or an allergic reaction. When a dog’s body cannot adequately dissipate heat, heatstroke is likely to occur and is often fatal. At high temperatures, cells within your dog’s body start to die and the brain starts to swell. Seizures are caused when the electrical impulses in the brain misfire; resulting in rapid twitching in muscle fibres. The increase in muscle activity further increases body temperature. The excess temperature in the body prevents it from functioning correctly eventually resulting in major organ failure. 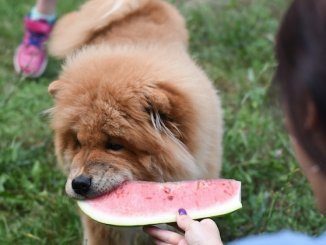 There are certain factors which can put a dog at a higher risk of heatstroke. These include: obesity, poor lung and/or heart function, hyperthyroidism, brachycephalic breeds and thick/long coated breeds. Heatstroke can be fatal, so watch for early symptoms. If you suspect your dog has heatstroke, seek immediate veterinarian attention. An anaphylactic shock in dogs manifests slightly differently than in humans. In humans, the response is primarily in the respiratory system. In dogs, it firstly affects the cardiovascular and gastrointestinal systems and secondly, the respiratory system. Anaphylactic shock will likely develop into seizures, collapse and unconsciousness. It is fatal. In any suspected anaphylactic shock, seek veterinarian attention immediately. What is the difference between normal panting and more serious panting? Normal panting should be expected when the environmental temperature has increased and when you have been out exercising with your dog. This is how they cool down. Always be mindful of the risk of heatstroke. You know your dog best, any increase in panting or any additional symptoms should be checked out by a veterinarian. Why do dogs pant at night? Your dog could be too warm at night and they are simply trying to cool down. However, night time panting can be associated with liver issues in dogs. Feeding your dog too late at night can also raise their metabolic state which increases panting. Why do dogs pant for no reason? There is always a reason why your dog will be panting. Typical panting should be expected when they are trying to cool themselves down. Excessive panting or additional symptoms should always be discussed with a veterinarian. 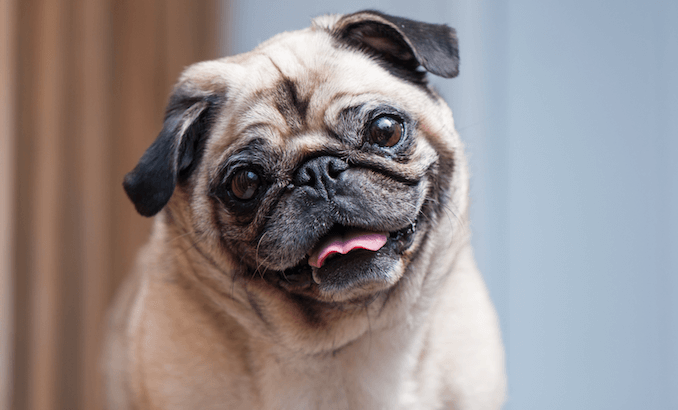 Why do brachycephalic breeds pant so much? Brachy breeds tend to have furrowed faces. Due to their small nasal passages and short windpipes, they don’t pant as efficiently as other breeds. This means they have to pant more to cool themselves down. They are also more sensitive to environmental temperature changes and at a higher risk of heatstroke. Why do dogs pant when they are scared? The stress response in a dog increases their heart rate which in turn increases body temperature. 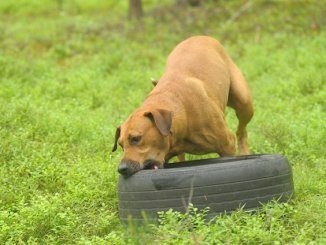 Dogs pant to thermoregulate. Why do dogs pant with their tongue out? The tongue is an important part of the cooling system. When dogs get hot, blood flow increases and this includes to their tongue. As the dog pants, moisture evaporates and cools the tongue. As the tongue cools down, so does the blood which flows through the body. Panting is a completely normal behaviour to expect from your dog. Expect to see them panting when they are sunbathing in the yard and also sleeping in front of the log fire when it’s cold. You may also find them panting if they’re a little worried about something. Brachy breeds will always pant more than long snouted dogs too! 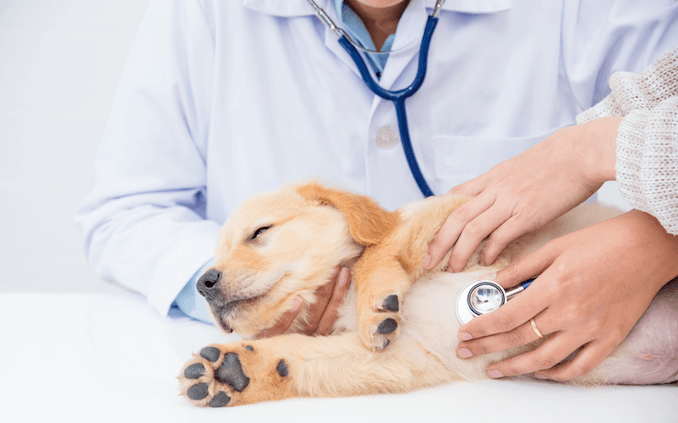 As always, if there is a significant change in your dog’s health or behaviour, it’s always best to seek the advice of a qualified veterinarian.